WIAW: My Eats and What I am NOT eating anymore. Lately I’ve been making a lot more meat meals; fish, chicken and even some pork since my husband is away so much. Not many vegan meals going on these days….it’s kinda nice for a change! 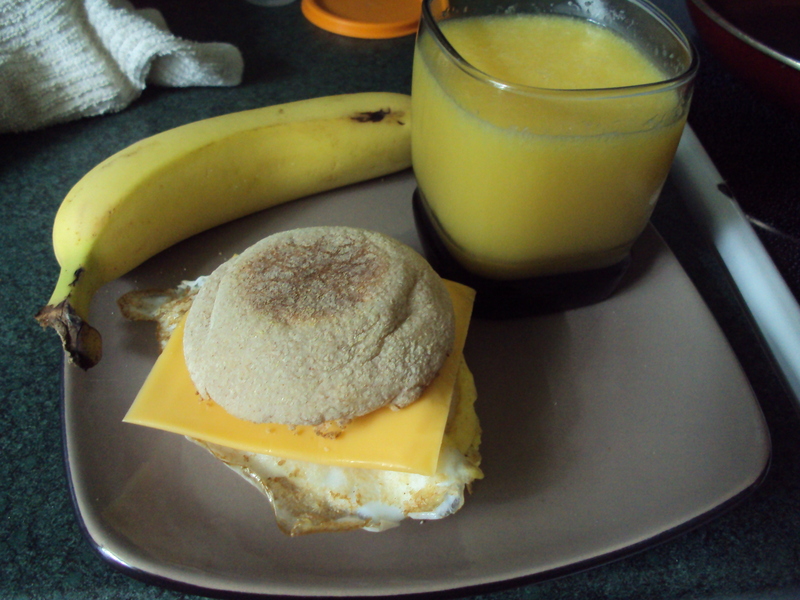 Breakfast for me: Simply Orange Juice, Banana and Egg/Cheese on English muffin. (bad cheese I know but oh so good every once in a while). A little trip to good old Costco got us $50 worth of cheese!!! 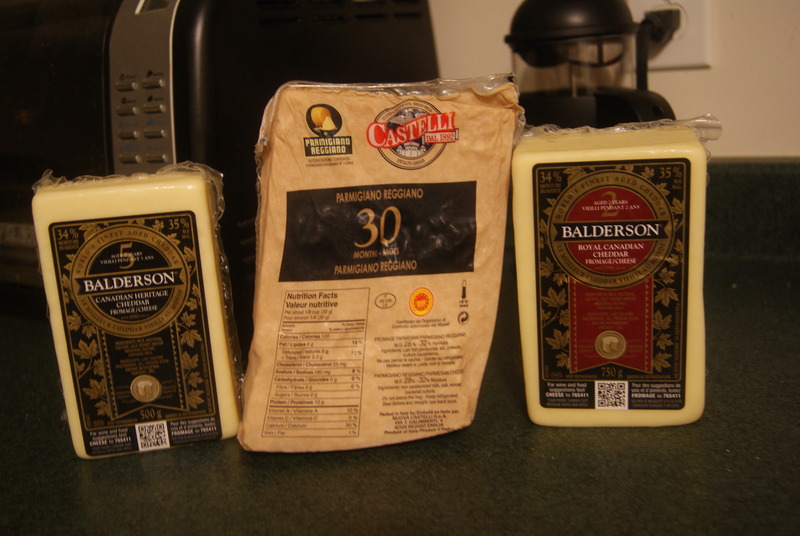 The 5 year cheddar is mine, the middle parmesan is for my neighbour and the 2 year cheddar on the right is for my Aunt/Uncle we are visiting soon. Who eats (needs) this much CHEESE??????? Lunch: The most random lunch I have every made! Cherries, strawberries and blueberries from our local farmer’s markets. Left over (cold) BBQ’d porkchops. 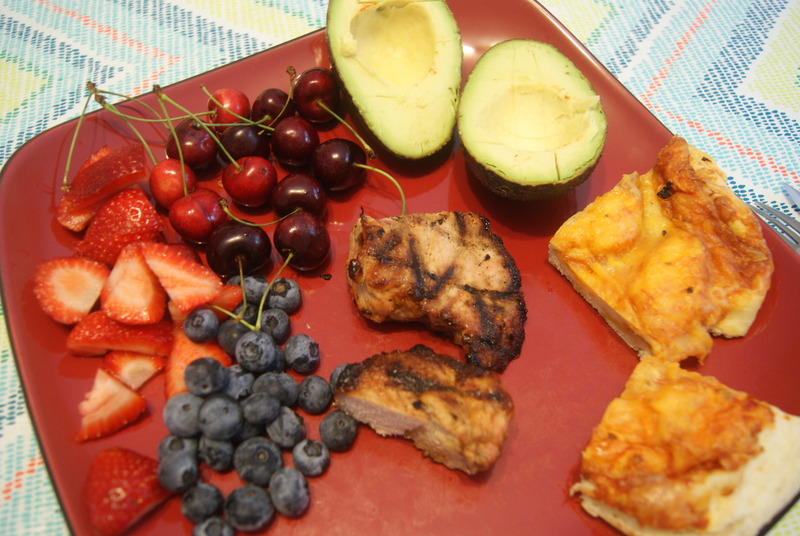 Avocado….missing in this photo is a hard boiled egg I ate with the avocado. Well, I shared the avocado with baby H, I couldn’t get enough berries into me and I wanted to empty the fridge of leftovers. 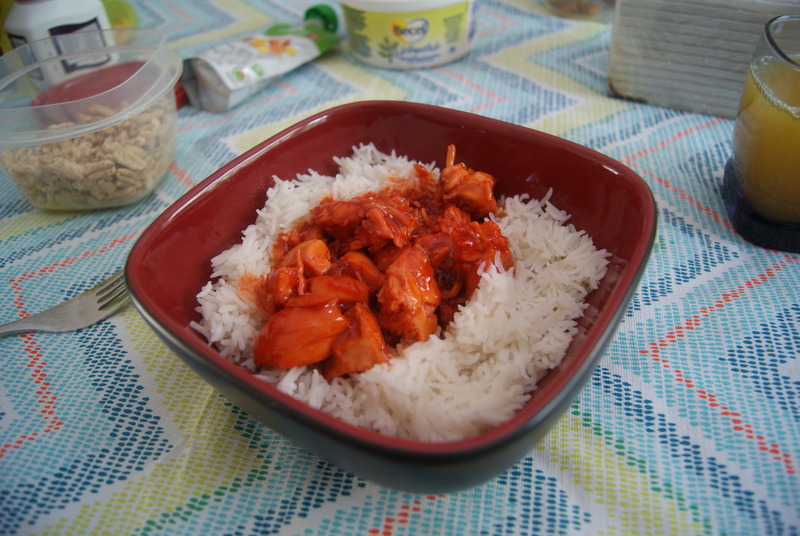 Supper: Russian Chicken over rice……..YUM! That was a lot of random foods in the last week! About a month ago I decided to stop drinking pop (mainly Coca-cola) after reading an article online. I’ve read all that information before about Coke and how terrible it is for you but I would just limit myself to “only when I eat out with work” and “don’t bring it in the house”. And then it turned into “I’ll just buy these mini-cans because I can’t drink a full can anymore”. I even stored them in a place that I don’t look that often and only had 1-2 in the fridge if I remembered. Who drinks warm pop? Yuck! It would force me to plan ahead if I wanted one, and I was okay with that. It had been a few weeks since I had a Coke and I thought it would be good to just have one more before saying Goodbye! I went grocery shopping and decided I would buy that one “last” bottle of Coke to drink at dinner that night. As I walked by numerous stands filled with pop I kept saying I’ll get it at the end. I got home and realised I forgot to by the Coke. I was really looking forward to one last hurrah but it didn’t happen. It’s been over a month since I’ve had a pop. Even though I’ve had two occasions that I really, REALLY wanted a pop…I didn’t cave in and go buy it. Yeah, me! I’ve also decided to stop drinking milk! When I was 17, I was getting really really sick from foods I was eating but couldn’t figure it out. I ended up in the hospital twice because I was so sick – yuck. I had allergy tests done and then a lactose intolerant test done too! Sure enough, dairy was the problem. I gave up all dairy except yogurt for about 7 years and then starting drinking lactose free milk and taking lactose pills if I had ice cream or cream cheese. Recently I’ve been having some stomach problems and decided that cutting milk out of my diet couldn’t hurt me. I rarely have ice cream so I’m cool with taking a pill for that. It’s the 5 year block of cheddar cheese that I’m going to have a HARD time giving up. We’ll see if that happens. So, for now I’m drinking coconut milk that my husband drinks. Have you EVER spent $50 on cheese? JUST cheese? Do you drink milk or something else? Oh, I love chocolate too. My ultimate favourite chocolate has to have mint in it 🙂 Almond milk is nice too. Oh yeah, we have definitely spent that much on cheese… on plenty of occasions. We are HUGE cheese fans. It was the only thing I missed about having to give up dairy while nursing. And when we have bought $50 in cheese it has been for just us or when we are having cheeses for everyone at xmas. That 5 yr old balderson is easily our favorite. Now that said, when we do spend $50 on cheese for just us it’s because it’s going to last a long time… we don’t eat that much in a week or anything!! Pop I have never been a big fan of anyway, so at least that’s never an issue for me! Now that I am back to eating dairy I still have no desire for milk itself – I am still drinking coconut milk in tea etc. If Sai ate cheese we would TOTALLY spend $50 on it! This 5 year old balderson is really hard for him not to eat it…lol! This block lasts a long time for us too, all you need is a little piece here and there. Sometimes the most random lunch plates are the best. I love the variety you had to choose from. At least there is a good variety of colours on my plate, right! I actually really try no to drink milk or soda either. . . with the exception of ginger ale kicks every once in awhile. Cow’s milk just kind of grosses me out anymore, and I just can’t stand all the crazy ingredients I don’t understand in soda. Awful. PS: your food looks AMAZING. Zach is jealous of the cheese. Yeah ginger ale is pretty awesome. 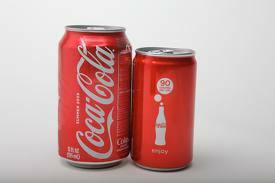 I guess I just can’t get over how much crap/chemicals is in Coca Cola. Yuck. I’m hoping I can stick to it! No I’m the same way. There is not a single good thing about Coke for you, so I absolutely try and steer clear of it.